Though it looks like a tomato of a different color, a tomatillo is actually more closely related to gooseberries and ground cherries, according to Washington State University. Though cooking tomatillos brings out a rich flavor, tomatillos can also be eaten raw. They'll add a zip to a variety of recipes, as well as supply certain key nutrients. Raw tomatillos have a distinct flavor that can take some getting used to. Uncooked tomatillos are sour, but cooking the tomatillos will yield a lemon flavor, according to Oregon State University Extension Service. The raw vegetables are safe to eat, as well, as long as you wash and prepare them correctly. 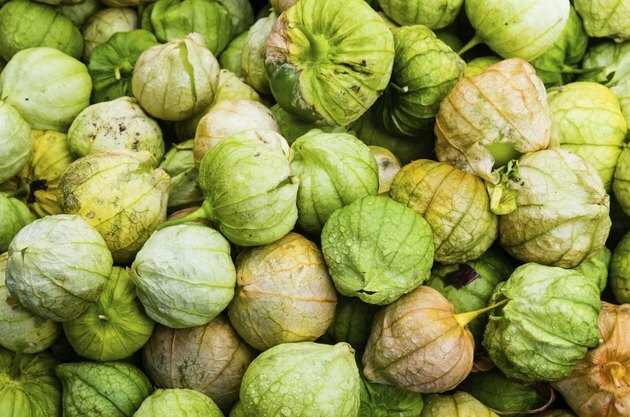 Wash your hands before handling the tomatillos, and use only clean knives and cutting boards to prepare them, which will reduce the risk of bacterial contamination. Rinse the tomatillos under cool running water, scrubbing them gently with your hands to remove dirt, bacteria and pesticide residue, recommends Colorado State University Extension. One of the easiest ways to incorporate raw tomatillos in your diet is to dice them finely and add them to salsa, according to Oregon State University Extension Service. You might also puree tomatillos with cooked squash and onions for a creamy soup recipe or scatter chopped tomatillos over a bowl of soup or chili, Washington State University suggests. Chopped raw tomatillos will jazz up the flavor of a pasta salad recipe, and thinly sliced raw tomatillos will enhance the flavor of a turkey sandwich, as well. A 1/2-cup serving of raw tomatillos contains 21 calories and 1.3 grams of dietary fiber. You'll get 0.41 milligram of iron and 0.15 milligram of zinc, as well. Raw tomatillos supply small amounts of magnesium, phosphorus and potassium, too. With 1.22 milligrams per 1/2-cup, raw tomatillos are also a good source of niacin, a B vitamin that helps you turn food into energy. That translates to 9 percent of the 14 milligrams of niacin women need each day and 8 percent of the 16 milligrams men require daily. Raw tomatillos contain vitamins A and K, also. Raw tomatillos will keep for about two weeks in the refrigerator. Store the vegetables in a paper bag until you're ready to use them. Remove the husks and wash the sticky exterior well before adding raw tomatillos to recipes. Cooked tomatillos are nutritious, as well, and cooking them is a healthy alternative for people who find the raw taste too strong or unpleasant. Oregon State University Extension Service: Tomatillos, Ready or Not?